Despite the long-standing ambitions to conceive of humanity from an expansive proportion, the scale of the shared crises we face render these generically existential questions urgently necessary – not only philosophically, but ethically and pragmatically as well. What sorts of concepts can we develop to fathom ‘humanity,’ and how can we learn to exist in those very concepts? This latter point of existing in concepts is essential. It is one thing to say that all humans belong to the ‘we’ of geohistory, for example, but it is quite another to transform this saying into behavioral traction. Countless injustices have been unleashed from this category we call ‘human,’ and those traumas don’t magically disappear out of historical convenience or our present crises that acutely demand maximal solidarity. Many of said traumas have been enacted in the name of cosmopolitanism, but have been enacted as a brutally bloated Eurocentric particularity thrust onto the world to dominate and conform humanity into a homogenous mold of itself– that is, into a familiar image. Until the historical exclusivity of this category ‘human’ is grappled with, hopes that we humans may unite under the common threat of the Anthropocene remain an ahistorical idealism, trapping us in the immobility of wishful thinking. We cannot brush historical reality aside, but we can amend our paths and corresponding epistemologies because of it. Nor can we let that historical reality arrest us absolutely, as we face up to an indispensable project of planetary-scale humanity for our survival and potential flourishing. 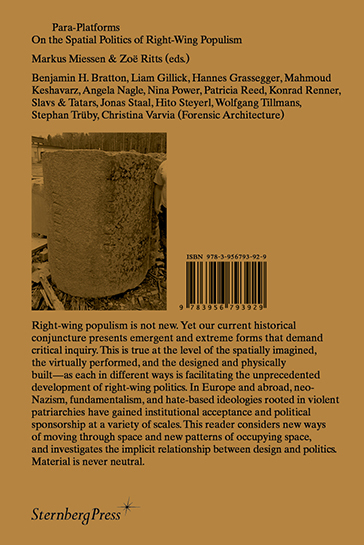 Patricia Reed, "Solidarity without Sameness", in Para-Platforms: On the Spatial Politics of Right-Wing Populism, eds. : Markus Miessen & Zoë Ritts (Berlin: Sternberg, 2018).